"Grout" is a thin, coarse mortar that is spread and pressed into cracks (also called "joints") between tiles or other hardscape units to fill them (thus helping to keep water out) and consolidate the adjoining tiles into a solid mass. "Grouting" is the process of this spreading and pressing. A grout float is the tool used in this operation. Not all grout is exactly the same, even if we limit the discussion to traditional grouts. One difference is in how ready it is to use when you buy at the home improvement store. Usually you buy it in powder form and then mix it when you get home. But you can also buy containers of premixed grout. If you have the kind that does not come premixed, you will mix it with water (the ratio of water to grout powder will appear on the back of the container) when you are ready to begin your project. You also have to pick between sanded and un-sanded grout, and the deciding factor will be the size of the space between the tiles. If the cracks between the tiles measure 1/8 inch or less, buy un-sanded grout. When you will be grouting bigger cracks, shrinkage becomes more of a concern, and the solution is to use a sanded grout. Grout comes in different colors, so you will want to choose a color that complements your project. Finally, some grouts come with a latex polymer additive, which improves hardening of the grout. A strong bond is important for a patio that has to withstand the elements outdoors, making a grout with a polymer additive a good choice for such projects. The bottom of the grout float, the part that is used to actually spread the grout, is usually made from rubber. The handle can be wood or plastic. Using a grout float is messy business but basically straightforward. You dab some grout onto your tool and start spreading it across the tiles, holding the tool at a 45-degree angle. The principle is the same whether you are grouting indoors, for a bathroom, or in patio work in the yard, when laying tile for an outdoor patio. Although the idea is to work grout into the cracks, you will inevitably get a lot of it on the tiles, too. 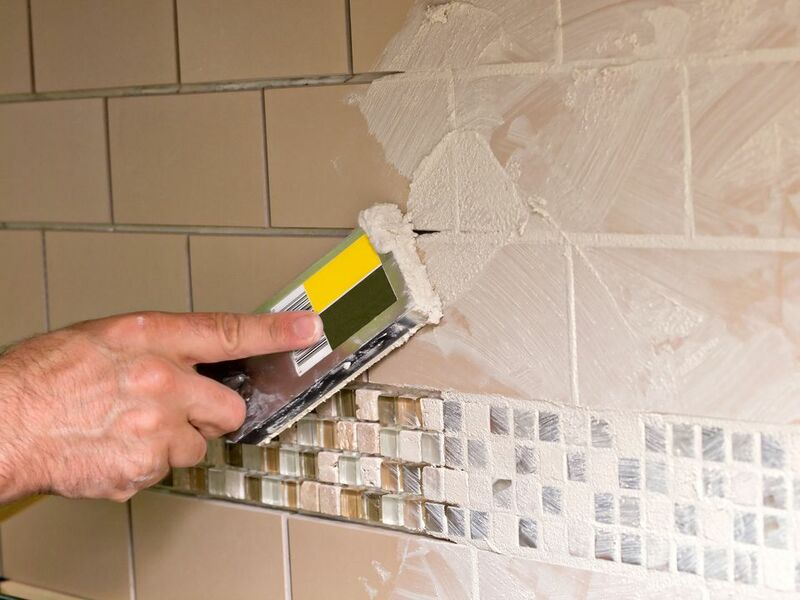 That is perfectly all right when grouting tile, so do not panic: You have not done any real harm, because the grout can be wiped off later easily enough. While you are grouting, keep a tile sponge and bucket of water close by for this purpose. While on the subject of cleanliness, remember, too to keep your grout float clean. Periodically rinse off your grout float. It will be easier to spread the grout if the tool is clean. If you are undertaking a large DIY project, choose a grout float that feels comfortable in your hand. Try out different models at the hardware store before buying. If you have a big job in front of you, a little bit of extra comfort makes a huge difference. Grout floats can be found at most home improvement stores. Beginners will be surprised to learn that there are various types of grout floats. If you are using epoxy grout (a non-traditional type of grout), choose a grout float made to be used with epoxy grout. In fact, when we employ the term more generally, there is an even greater variety of different kinds of floats, so you have to be careful when shopping. Hand floats meant for concrete work can be made from aluminum, steel, magnesium, resin, or wood on the bottom. Resin and wood types will make marks on the surface of concrete; this may be desirable if you are seeking to create a more slip-resistant surface. Metal types are preferred if you are not looking to create such "texture" and prefer, instead, a completely smooth surface. Despite all of these different materials used to make concrete floats, the concept is the same: A concrete float is a spreading tool used in masonry, having a handle fastened to a flat piece. Such floats are used, for example, to finish the surface of a concrete patio or walkway. Employing an arc-shaped, sweeping motion, you smooth over bumps in the concrete surface with the float. Then there is the "bull" float (also used for working with concrete), a large tool equipped with a long pole for a handle, so that you can reach out over the surface of a concrete patio to smooth it out, without stepping on it.